Alysha Clark led the Storm with 22 points on 9-10 shooting. Photo via NBAE/Getty Images. 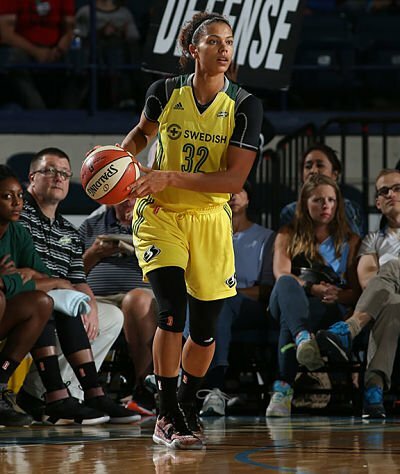 Seattle – Nearing the mid-point of the fourth quarter, Alysha Clark missed a three-pointer from the baseline. It wouldn’t be notable in itself, but she had made the nine shots that came before it. The 29-year old forward finished with 22 points on 9-of-10 shooting — after scoring 20 combined in her first four games — as the Storm cruised to its fourth consecutive victory, beating Indiana 94-70 at KeyArena on Sunday. 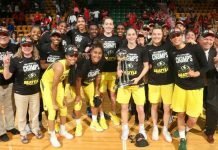 Clark was one of four Seattle (4-1) players to finish in double figures, along with Jewell Loyd, who had 13, and Breanna Stewart and Crystal Langhorne, who each finished with 12. Tiffany Mitchell led the Fever (2-3) with 13 points, followed by Candice Dupree’s 11 and 10 from Natalie Achonwa. Seattle took an early lead on Sunday — with 13 of the game’s first 17 points — and had a four-point edge after 10 minutes, paced by Clark’s 12. That hot start indeed carried into the second quarter, as Seattle went on a 9-0 run, holding the Fever scoreless for the first four-plus minutes. A lay-up from Langhorne with just over two minutes in the half put Seattle up by double-digits for good. Seattle took a 13-point lead into the break, outscored the Fever by nine in the third quarter, and led by as many as 28 in the fourth. The Storm finished the game 35-of-57 from the field (61 percent) and 8-of-18 from 3-point range, as all 11 players in uniform scored for Seattle. That was a sentiment echoed by Chatman. But the main story of the afternoon was Clark, and her franchise-record shooting streak. Not that she was paying attention to the streak as it happened. 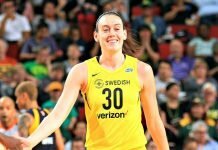 And though Clark led the scoring, Storm head coach Jenny Boucek had praise for her “humble superstars,” as Stewart, Loyd, and Sue Bird combined for 18 assists. At 4-1, the Storm is three games over .500 for the first time since 2011. Seattle will try to extend its winning streak to five in the final game of its homestand on Saturday against Minnesota at 6 p.m.
Indiana is at Dallas on Tuesday night, before starting a three-game homestand that concludes with a rematch with the Storm on June 9. 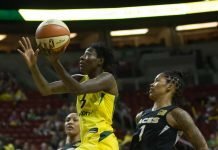 Kaleena Mosqueda-Lewis did not play for Seattle, after suffering a right knee bruise in the first quarter of Friday’s game against New York. Seattle is now 2-0 against the Fever this season, winning 87-82 in the first matchup of the two teams on May 14. Both of Seattle’s 2017 draft picks made their first field goals in the WNBA. Syracuse product Alexis Peterson finished with five points, while Lanay Montgomery out of West Virginia had two. Jazmon Gwathmey made her Indiana debut, and finished with six points in 11 minutes of action.